Maritime search and rescue (SAR) operation is a critical process that aims to minimize the loss of life, injury, and material damage by rendering aid to persons in distress or imminent danger at sea. Optimal allocation of SAR vessels is a strategic level process that is to be carried out with a plan to react rapidly. This chapter seeks to evaluate the performance of a SAR boat location plan using simulation. The proposed methodology in this chapter works in two stages: First, an optimal allocation scheme of SAR resources is determined via a multi-objective mathematical model. Next, simulation is used to test the performance of the analytical solution under stochastic demand. With the heaviest traffic and maritime risk, the methodology is applied to a case study in the Aegean Sea. Each year the Turkish Coast Guard (TurCG) receives hundreds of calls and distress signals from the vessels in danger. As the time difference between life and death can sometimes be measured in minutes, quick response to these signals plays a vital role in reducing fatalities and physical damage (Razi and Karatas, 2016). 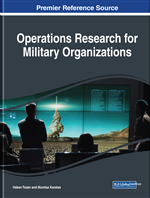 However, an average SAR operation requires substantial amounts of time, effort and money as well. Hence, emergency response operations should be planned with care and foresight. SAR operations planning can be counted as an emergency system planning. As discussed by Green and Colesar (2004), despite many challenges, operations research and management science applications play an important role in decreasing the negative outcomes of emergencies. This argument is particularly applicable to SAR operations conducted by the TurCG. TurCG conducts SAR operations in the Turkish Maritime SAR Zone, which is divided into four sub-responsibility areas as follows: the Black Sea, the Sea of Marmara and Adjacent Straits, the Aegean Sea and the Mediterranean Sea. Of all those sub-areas, the Aegean Sea has the heaviest marine traffic due to maritime transportation from and to the Black Sea, shipping, cruise tours, yachting, windsurfing and enormous illegal-border crossing activities. In 2014 alone, TurCG conducted 842 SAR operations, and 716 of them (85% of all operations) were in the Aegean Sea. The data provided by TurCG reveals that during those operations, 12,901 victims were saved, 190 boats were recovered undamaged and 154 lives were lost, while 62% of all operations were related to illegal-border crossing activities. Considering the abovementioned risks related to the increasing traffic density, Razi and Karatas (2016) detailed the problem of establishing well-planned SAR organizations for the TurCG and they developed a decision support tool named as the “Incident Based-Boat Allocation Model (IB-BAM)”. IB-BAM is a three step methodology designed to allocate search and rescue resources. The methodology first ranks and assigns a weight to each incident type observed in the region. Next, utilizing deterministic historical incident data, a Zonal Distribution Model (ZDM) generates aggregated weighted demand locations. Finally, it employs a multi-objective mixed integer program (mo-MIP) model to determine locations and responsibility zones of each SAR boat. Using IB-BAM, the authors attain a more efficient utilization of boats considering multiple objectives.